This past weekend I was delighted to attend the sold-out premiere of Dear Basketball at New York’s Tribeca Film Festival. 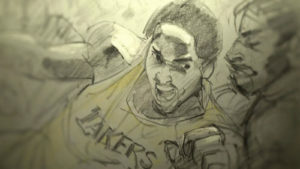 The short film is directed by master animator Glen Keane, based on sports legend Kobe Bryant’s retirement poem about the game he loves, and played brilliantly, for twenty years. Narrated by Bryant, with a subdued yet majestic music score by five-time Oscar-winning composer John Williams, this deeply personal film is six minutes of captivating, whirling, non-stop motion and emotion. 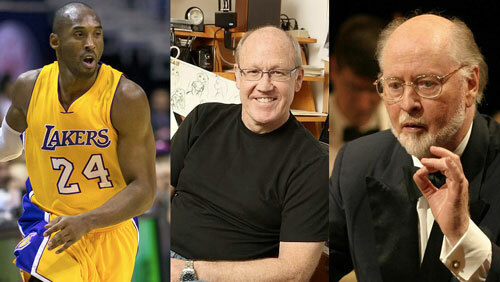 To put it in the vernacular: Dear Basketball is a power dunk by three super players. 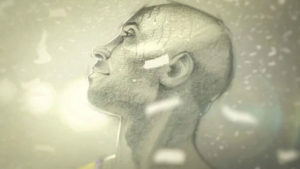 The hand-drawn film smoothly alternates between the child Kobe dreaming of playing for the Los Angeles Lakers, his achievement of that goal as an adult, and the inevitable process of moving on to a new life challenge. Sounds like a lot to pack into a short, but Keane’s elegant production combines clarity and lyricism. Significant moments in Kobe’s life morph from a boy’s point-of-view shooting hoops in his bedroom with a “ball” of tube socks, and practicing “foot mechanics” by setting up chairs as obstacles, to the sports giant he became during a career of glorious triumphs and physical pain. 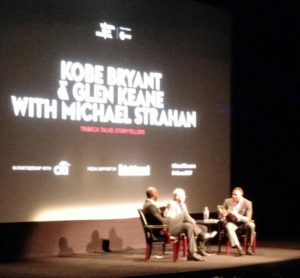 The film opens with a scoreboard countdown, a roaring crowd and we, the audience, running on the court with Kobe. Tearing through the competition toward the basket, we soar with the ball through the hoop, its netting an abstract splash dissolving dreamlike into a transition of time and space. 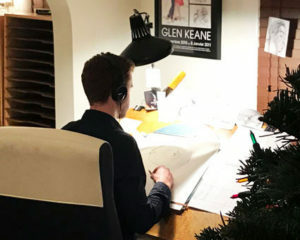 There is an experimental expressive freedom in Keane’s direction and animation, which he rarely had the opportunity to venture into as a Disney animator. The films immersive quality is achieved primarily through sequential drawings on single sheets of paper. You are always aware that the visuals are drawings — some beautifully rendered with detail and fully animated, even to the sweat trickling down Kobe’s brow; some drawings are wild scribbles, lines that coalesce into, and out of, recognizable shapes. The action and “camera” point-of-view takes place within drawings of moving backgrounds that quickly, freely, fluidly change locale and time periods, as storyteller Keane desires. As with other great animated cartoons, no matter the style, audiences become deeply involved with the story through the characters. Keane mastered “illusion of life” animation’s power and charm at Disney, and brings it with joy to his free-form storytelling here. 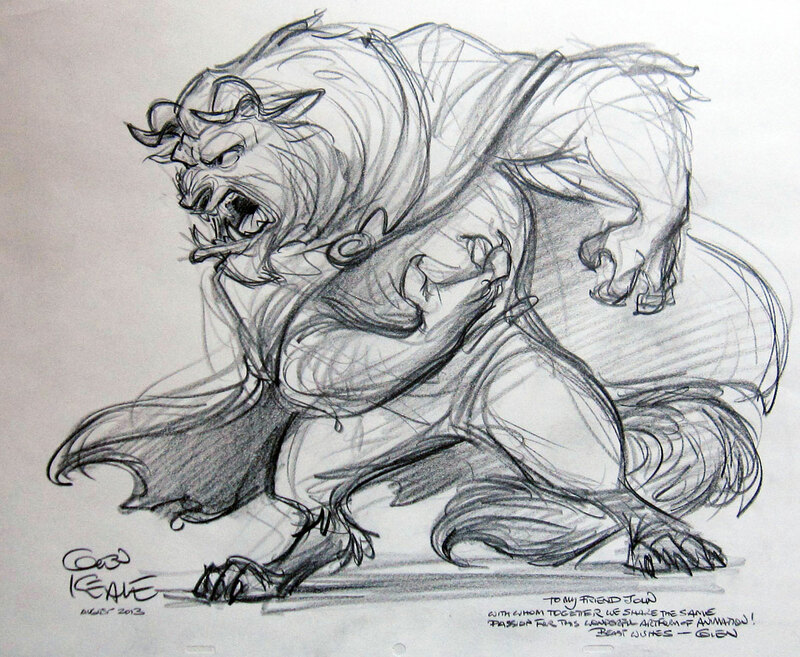 Expressive sequential graphite-penciled story sketches are essential to Keane’s creative process; for example, his dramatically expressive thumbnail storyboards for The Rescuers Down Under and Pocahontas, among other films. Rough story and animation drawings are rarely seen in their nascent form in his Disney oeuvre, but their raw vitality pulses in this film. Dear Basketball is a “pencil test” writ large and beautiful, reminiscent of John and Faith Hubley’s experimental films. Bryant formed Kobe Inc. a multi-media content creation company to help athletes learn the process of excellence and maximizing potential. He asked of himself and the Tribeca audience, “What can you control” in seeking your goals. 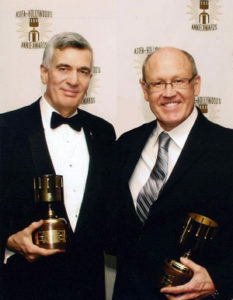 Cited as an “inspiration” was his friend Michael Jackson, who advised Bryant, when he was with the Lakers, to up his game by seriously “studying the game,” as deeply as Jackson studied entertainers he admired; for example, Jackson pored over sheet music and recordings of The Beatles, and analyzed the dancing of Gene Kelly and Fred Astaire. In addition to persistence, Bryant noted that his career was “built piece by piece,” not by focusing on the top of a personal Mount Everest he wanted to reach, but instead on “each step, one foot after the other, and perfecting those steps” to reach the mountaintop. Members of the Dear Basketball creative team at the 2017 Annie Awards in Los Angeles. 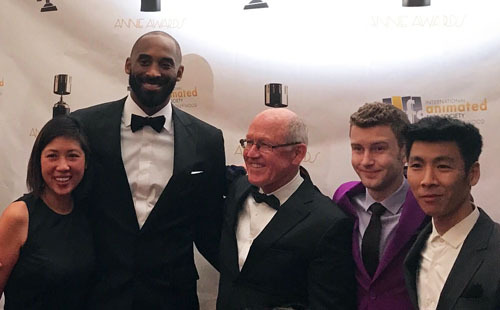 From left, producer Gennie Rim, Kobe Bryant, Glen Keane, animation assistant Aidan Terry and designer/compositor Scott Uyeshima. When Glen Keane left Disney, he no longer had an army of “clean-up” or ink and paint artists to transform his drawings into a uniform Disney style. Now, the independent Glen Keane Productions has a small crew in Hollywood helping the master animator/storyboard artist retain the aliveness of his personal “signature” on the screen. 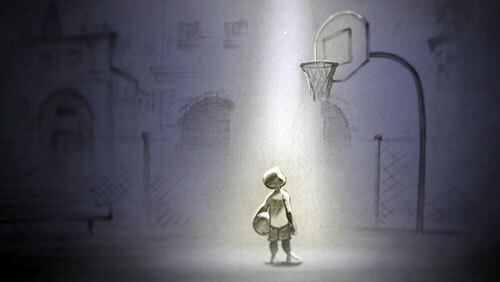 The crew on the nine-month production of Dear Basketball includes producer Gennie Rim; production designer Max Keane; animators Minkyu Lee and Bolhem Bouchiba; effects animator Phillip Vigil; and animation assistant Aidan Terry. 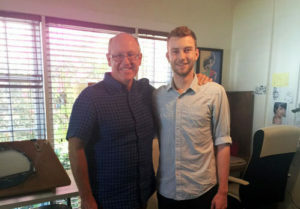 On a personal note, Glen Keane, master animator, story artist and major mensch of great integrity, honor, and humility, has been a friend for many years. I first got to know him as an essential, articulate and witty interviewee for my periodical articles and my 2001 book on Disney’s Nine Old Men. We corresponded via email for years. When we were both honored with the Winsor McCay Award at the 2007 Annie Awards ceremony, I boldly asked Glen if he might sign and send a sketch of the Beast to me. A 2013 drawing of The Beast by Glen Keane for John Canemaker. Click to enlarge. In 2015, Glen was in New York screening Duet at the Museum of Modern Art, and he generously found time to visit NYU Tisch, meet our animation students, and to give a spellbinding lecture (with spontaneous drawings). Last June, Gennie Rim, Glen’s producer on Duet and other projects, contacted me, seeking “any stand-out students or alumni” for a new 2-D project. I saw it as an opportunity to reciprocate Glen’s generosity, and suggested young Aidan Terry, a brilliant 2016 graduate and mainstay of our NYU Tisch School of the Arts/Kanbar Film and Television’s animation program. Equally adept at hand-drawn character animation and the digital realm (including VR), Aidan joined Glen’s team last summer on Dear Basketball. Aidan Terry at work on Dear Basketball. “I am already impressed with this young man,” Glen wrote to me in July. We at NYU are very proud of Aidan! Dear John, kindly tell me why. Why am I so dumb that I did not ask you what to see at Tribeca Fest. i will promise you: Next Year when the list of offerings is posted i will ask you. You will point me in the best directions as you always do.